April 17, 2012. Irvine, CA and Shenzhen, China. In partnership with Intel, Cybernet has developed the most advanced Windows-based medical tablet PC in the market. As a result of this successful partnership, Intel invited Cybernet to participate in the China Medical Equipment Fair (CMEF) being held in Shenzhen, China April 17-20, 2012. CMEF is the largest medical equipment exhibition in the Asia Pacific region, with more than 2500 companies and 150,000 visitors from 100 countries around the world. It is quite an honor to be invited to display at the Intel booth for this event. Cybernet, the pioneer in all-in-one PC technology, has its R&D and manufacturing operations in Taiwan and China. Cybernet manufactures many different models of medical all-in-one PCs, and is very familiar with the computing needs of today’s health care industry. In 2010, Cybernet Taiwan and Intel Asia began discussions regarding Intel’s newest processor technology, Cedarview, for medical tablet use. The Cedarview platform has low power consumption, which is ideal for tablet devices. When Intel was developing the Cedarview platform, they were targeting many different markets where tablet use was on the upswing, one of which was health care. After their discussions, Intel Asia worked with Cybernet to provide technical data that was used to develop the first Windows-based medical grade tablet to use the Cedarview platform: Cybernet’s CyberMed T10. 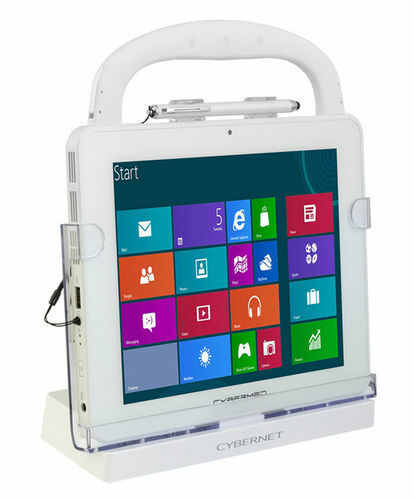 Cybernet launched the CyberMed T10 tablet in February 2012 at the HIMSS show in Las Vegas. The CyberMed T10 is a full-featuredWindows-based medical tablet with a 9.7-inch display. It has an antimicrobial case, weighs only 1.9 pounds, and has the power to handle any EMR or medical software. The T10has the Intel Cedarview processor, and comes standard with 4GB of DDR3 RAM, and a capacitive 10-finger multi-touch screen - priced at $999. The CyberMed T10 is loaded with all the features that medical professionals need: an HDMI port, a dual camera, a long life battery and a front bezel that has an IP65 rating to enable cleaning with liquids. The T10 tablet also carries FCC, CE, and EN60601-1 3rd edition certifications. Learn more at the CyberMed T10 webpage.